Guava, in the form of sweet guava paste, is a popular filling for all kinds of pastries in Cuban cuisine. There is a local Cuban bakery in my area – Porto’s, for anyone in the LA area – that makes all kinds of pastries with guava. It only takes one or two bites to realize that the sweet guava fillings not only a good match for buttery pastry, but are quite addictive! This guava tart isn’t inspired by a dish from that bakery, but it is a Cuban recipe from Eating Cuban, a cookbook that I really enjoy. This tart is very simple. It has a filling made with guava paste sandwiched between two layers of tender and buttery crust. 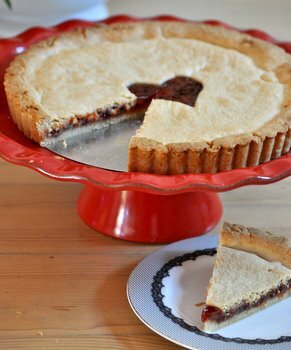 The filling itself – since it is only made with guava paste – is very sweet, but it is toned down very well by the lightly sweet pastry that makes up the rest of the tart. Having a filling with only one ingredient also means that this tart is easy to throw together without much prep work once you have a block of guava paste on hand to start with. The pastry dough is much like the dough for a butter cookie, and while it is lightly sweetened, the dominant flavor is butter once it has baked. It is tender and has a fantastic texture once it has baked, neither too soft nor too firm. The dough can be a bit crumbly if you’re not careful (and a bit sticky if you don’t chill it! ), but it can easily be patched with small scraps of dough if you accidentally tear it while rolling. 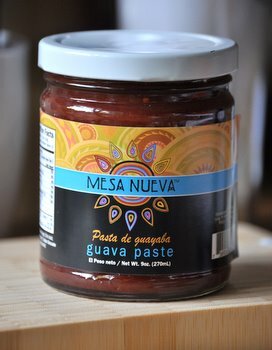 Guava paste is typically available at Mexican and Latin American markets, although it can sometimes be found at regular grocery stores (depending in the area) and specialty markets. The amount of guava paste given in the recipe is my suggestion for how much you should use in your tart. Since the paste is sliced, it is easy to make the filling into a thinner layer if you are worried about the tart being overly sweet for your tastes. Another way to temper the guava filling is by serving this tart with a few slices of good, dry cheese. A sharp Cheddar is a good choice (just as it is a good choice with apple pie), but I like Spanish Manchego as a side to this tart. That said, I also like a generous layer of guava filling and a big scoop of ice cream on the side, but I’m not above just grabbing a slice and eating it for breakfast with a cup of coffee, either! In a large bowl, cream together butter and sugar until light. Beat in egg, followed by vanilla extract. With the mixer on low, gradually blend in flour mixture until the dough comes together. Divide dough in half and shape each half into a disc. Wrap in plastic wrap and refrigerate for about 1 hour. Get out a 9-inch tart pan (a 9-inch springform would also work, though you will have to estimate the height of the sides of the tart). Roll out one piece of the refrigerated dough on a very lightly floured surface until it is no more than 1/4-inch thick and large enough to cover the bottom and sides of your tart pan. Roll dough around rolling pin and unroll over tart pan, pressing dough firmly but gently into all the corners of the pan. 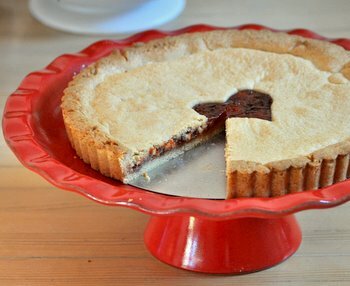 Slice guava paste into 1/8 – 1/4 inch slices and arrange in a single layer over the dough in the tart pan. Some slices may need to be cut down to fit. Roll out second piece of refrigerated dough on a very lightly floured surface until it is no more than 1/4-inch thick and large enough to cover the top of the tart. You may leave the sheet whole or use a small cookie cutter to punch a design in the top of the tart. Transfer dough onto the tart and press around the edges to seal. Bake for 30-35 minutes, until crust is golden brown. Allow to cool completely before slicing into wedges. Previous PostPrevious What is guava paste? how beautifully picturesque! neat combo for a new project for a breakfast slice; thanx! I’m always looking for new ingredients to work with and I had no idea where to find it thank you! Yum! I recently made cupcakes with guava paste that I brought back from Mexico (http://carlysulli.wordpress.com/2011/05/05/quequitos-de-guayaba/) and still have some guava pasta leftover. Maybe I can make a smaller version of this tart! I have never used guava in any baking, but this recipe might have to be my first! I LOVE Porto’s in Glendale. I always have such a hard time when I am standing in line before the never-ending bakery cases. My clients always get excited when I bring them a box of goodies from Portos. But I think my favorite thing about that place is the little old men grumbling at each other over their mid-morning coffees!